In southern Louisiana, relief efforts are well underway and the community has come together to support each other in an inspiring show of spirit that could not be dampened by the summer’s devastating floods. As the end of summer drifts into fall, the people of Baton Rouge have begun to live their new version of normal. For many this new normal is plagued by hunger and food insecurity, but thanks to our sponsor Humana we can all do our part to help those in need. In response to recent flooding, Humana is providing support and resources locally and partnering with the community to aid local relief efforts. With less than one week left to #CarryTheBaton, we are so proud of the Charity Miles community! You have come together to log (# of badges) virtual 5ks in support of Baton Rouge flood relief. Your hard work has already earned an additional $(# of badges) donation benefitting the local charity partners on the ground fighting food insecurity in southern Louisiana. There is still time to join our sponsor Humana in their efforts to help get the Baton Rouge community back on its feet. These last few days will be critical to reaching our goal of 10,000 5ks and $10,000 in additional donations to Baton Rouge relief efforts and we cannot do it without you! We created this image so you can spread the word and support Baton Rouge on social media. Please feel free to use this to get more people involved on Facebook, Twitter and Instagram. 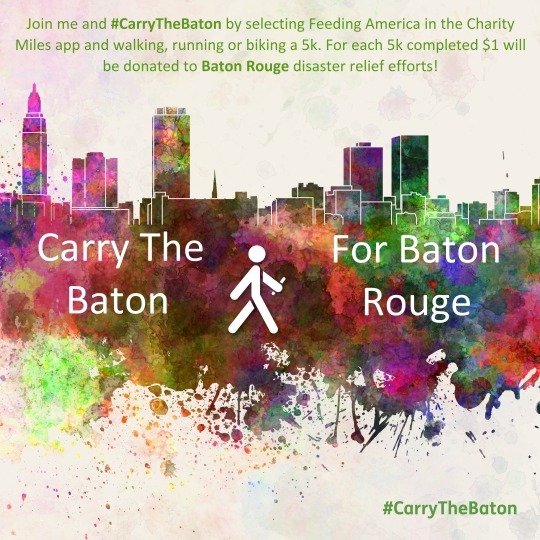 Encourage them to #CarryTheBaton for Baton Rouge by selecting Feeding America as the charity partner and logging a 5k with the Charity Miles app. For each 5k logged, Humana will donate $1 (up to our goal of $10,000) to the local charity partners that are contributing to the Baton Rouge relief efforts. Team, we only have a few days left. Baton Rouge needs our help, and together we can move to make a positive impact. Let’s get up, get out and #CarryTheBaton!